It's really a lot of fun because I get to try stuff I normally wouldn't. I've been wanting to use a Levi's label for a long time (saw the idea in a CK issue a while back). I had a pair my son had ripped the knee on, so I used them. I used the label for photo corners and a small tag. Then I got the idea to also use the belt loops. I love using clothing in a layout. I think it all came together nicely. I used some of the new Basic Grey papers. They are fabulous and I can really see myself using them for a lot of my photos, since the colors go well with most of my boys' clothes. On a side note, I have 1 bid on one of my other layouts! Doing a happy dance!!! If I can start making some money, I will be able to quit myjob for sure. It's a boost for my confidence! I tried actually on Tuesday to quit my job. Tried. They asked me if there was anything that might keep me from quitting. I told them it wasn't the work, but more that I really missed being at home, and being with my boys. The money has been nice, but I don't feel its worth the trade-off. Having a part-time job has felt so overwhelming to me, like 20 hours worth of extra work on top of everything else I do as a mom. I really don't feel like I'm being the best mom I can be. So, my supervisor and I are going to discuss some options next week, like possibly working from home a little. It sure is a real compliment that they like me and don't want me to quit. Another boost for my confidence. First of all, good for you for saying what you need in terms of work and family. I remember how hard it was to be a young mom with small kids. Even with a great hubby, those years can pull you in many directions. take my word, Ebay can be a great solution. But you have to create well, create fast, and be disciplined. Keep email folders for each item on sale and keep all records. 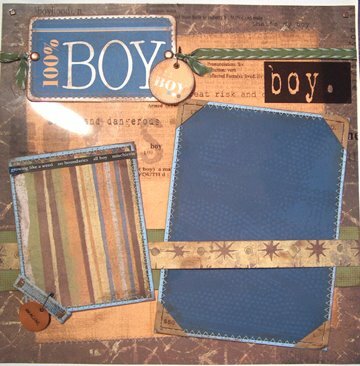 Second of all, your 100 % boy page set is wonderful! You are definitely on the style track you need to be for ebay. Good luck!